Surfica leashes offer maximum comfort and functionality while keeping you and your board safely connected. Available in a range of lengths and two chord thicknesses, Surfica leashes are warranted against manufacturing defects, and are a must have accessory when you hit the water. CUSHIONED CUFF: 5mm Neoprene provides padded comfort and support when there’s tension on the leash. The strong Velcro material will keep the leash fastened to your ankle at all times, and there’s also a quick release safety hook. STAINLESS COMPONENTS: High quality stainless steel swivel will not corrode, and the free flowing mechanism will minimizes the chance of your leash becoming tangled. EUROPEAN URETHANE: Surfica leash chords are made with the highest grade European Urethane making them tough and durable with a scientifically gauged stretch range. KEY POCKET: This convenient feature allows you to store your car or house key in the leash while your surfing. 10′ with 7mm straight cord. 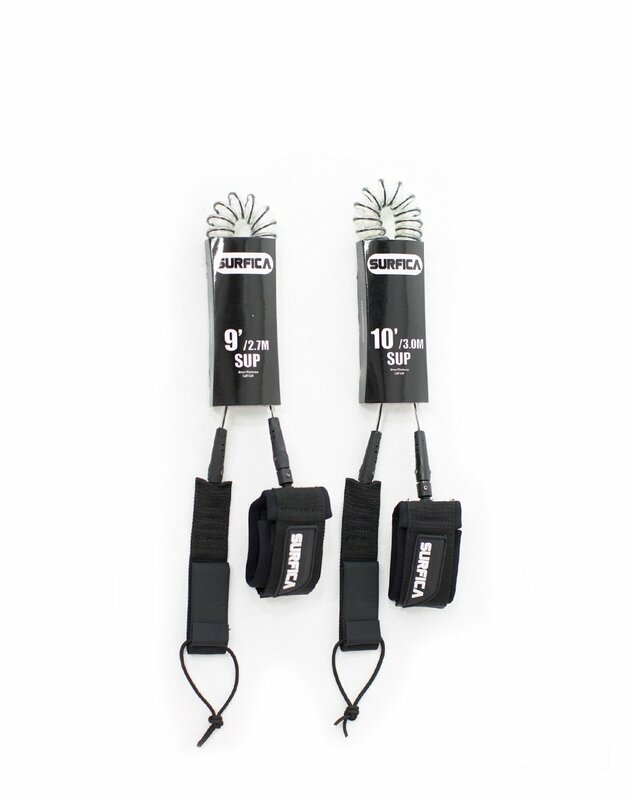 9′ with 8mm coiled cord for shorter SUPs up to 9’6″ in length. 10′ with 8mm coiled cord for longer SUPs above 10 feet in length.